The Learner Corpus Bibliography is stored in Zotero. Following reception of your login details for the LCA website, you will receive a Zotero Group Invitation in a separate email. Click on the link to accept the invitation. If you do not have a Zotero account, you need to register first. Once signed in, you will be invited to join the “Learner Corpus Bibliography” group. 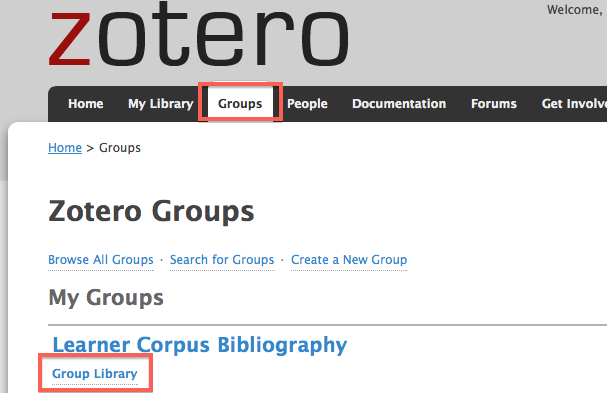 You can now access the shared bibliography by clicking the “Groups” tab and then the “Group library” link under the “Learner Corpus Bibliography” section. You can also save the following link on your computer for a direct access: https://www.zotero.org/groups/learner_corpus_bibliography/items. Please check here to learn how to use the LCB on your own computer.